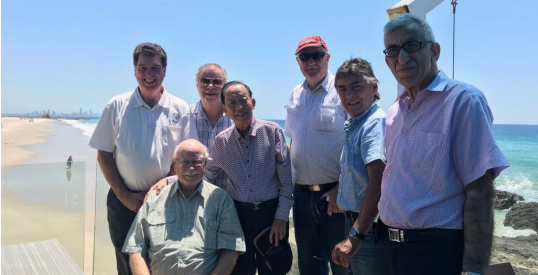 The FIP Board had always taken every opportunity available to meet and communicate with our continental and member federations during world stamp exhibitions under FIP Recognition or Patronage, as well as during Board meetings held in cities of member federations. FIP Board meeting with the APF Executives in Brisbane, 11 February 2018. Following the FIP Board meeting held in Brisbane on 10 February 2018, the Board members also had a very fruitful discussion and exchange of ideas on 11 February 2018 with the Executives of the Australian Philatelic Federation (APF) namely: John Moore (President), Glen Stafford (Immediate Past President and FIAP Exco member) and Gary Brown (International Officer). The FIP Board would like to express its sincere appreciation to APF for their active involvement and kind hospitality. Lunch at Gold Coast hosted by the Australian Philatelic Federation on 12 February 2018: standing from left: Mr Glen Stafford, Mr Bernard Beston, Mr Tay Peng Hian, Mr John Moore, Mr Aldo Samame, Mr Yigal Nathaniel. The FIP Board shall continue to have more of such meetingsin the future and the next upcoming Board meeting would be held in Sophia, April 2018.